Many books have looked at the effect of the war on the Home Front, but this is the first book to take a look at civilian life at home photographically from an international perspective: covering both Allied and enemy countries, juxtaposing the same situations in different countries to show a similar response. This fifth and final volume chronicles the events of the last year of the war and looks briefly at the beginnings of peace. At the start of the year the civilians on both sides were resigned to another year of pain and further belt-tightening as the shortages grew. Food and materials were in short-supply and the military had first-call on just about everything. People had to learn to make do with what they had. Although the U-boat campaign had been beaten by the introduction of the convoy, rationing needed to be introduced in Britain and France to even out the distribution of essential foods. No one would starve but many went hungry. However, throughout the Central Powers, because of the Allied blockade, the situation was far worse: everything was scarce or difficult to get hold of; some goods were unobtainable except from the Black Market. However, as neither side was prepared to give in, and with no end in sight, civilians just had to get on with their lives as best they could. 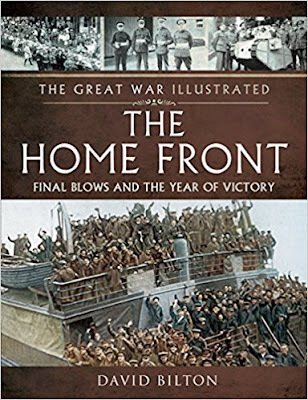 The book follows the same format as the previous four providing the reader with a brief overview of the events of the year on the Home Front at home and abroad, a detailed timeline and a wealth of photographs, divided into themes: raids, life on the Home front, Christmas, propaganda, casualties and captivity, and home defence. Many of the, over two hundred photos, have not been seen since they were published during the war and some are published here for the first time. The photos are international and give a flavour of what life was like for the civilian during the most turbulent year of the war. This unique series of international photographic books fits in with the author s more textual books on the Home Front: Hull in the Great War, Reading in the Great War volumes 1 and 2, and The Home Front in the Great War.